Well, it wasn't a win, but the Knicks built on their previous loss to the Heat with a second, slightly more palatable loss. On December 17 in New York, the Knicks kept pace with the Heat in the first half, then buckled after the break. 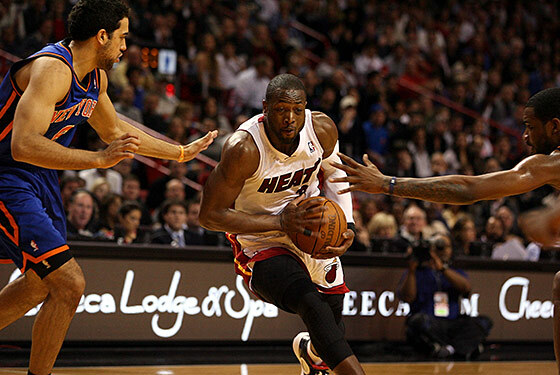 Last night in Miami, they flipped the proverbial script, improving as the night progressed, only to fall 106–98. The Heat opened the game with a mission to swarm Amar'e Stoudemire, leaving New York little recourse but to heave three-pointers. Mike D'Antoni's club couldn't hit the broad side of a blue whale, connecting on just two of eight outside attempts in the first quarter. Meanwhile, the Knicks chased the ball mindlessly and indiscriminately on the other end, surrendering inside position and allowing the likes of Zydrunas Ilgauskas to score off unbelievably easy put-backs. (Seriously, Ilgauskas managed a double-double in just fourteen minutes with only his "be tall," "collect," and "deposit" functions at work. "Run" and "jump" never factored into the process.) Miami owned a double-digit lead by the second commercial break and a twenty-point edge by the mid-second quarter. They paraded to the foul line and continued to bully New York on the glass. All signs pointed to a blowout ... until the Knicks struck back. In the second half, the Knicks abandoned the pick-and-roll for more flee-flowing ball movement and a renewed will to attack the rim. Their newfound aggression earned Amar'e and company foul shots, which had been scant in the early action, and brought them within six midway through the third. After the Heat corked that run and gained distance once more, Danilo Gallinari and Wilson Chandler led New York to just a three-point deficit with two minutes remaining. Not for long, though, as a Dwyane Wade three and some crucial missed free throws by Landry Fields and Raymond Felton (the former being of the "ball don't lie" variety) swung the game back in the home team's favor for the final buzzer. Wade, by the way, was the arm of the axis to inflict the most damage on the evening. LeBron James nearly reached another triple-double, and Chris Bosh owned the third quarter, but Wade's 40-point performance (including sixteen free-throw attempts) won the night. In fact, it won the season to date, as Wade became the first player in Miami's "Big Three" (or whatever) era to reach 40 points. Stoudemire, meanwhile, dropped 30 on 23 shots against the underrated Joel Anthony and his equally underrated forefivehead. Wade, Stoudemire, and both coaches were all teed up in a night that featured six technical fouls and some questionable calls for both sides by Steve Javie and friends. Feel free to forget all of the above, though, and save only Amar'e's posterization of the Bron for the ol' scrapbook. Now, there are no moral victories — a loss is a loss — and if you ain't first you're last, but the Knicks at least took a step in the right direction last night. That they almost managed to erase the damage of that horrid first quarter suggests that maybe — just maybe — they've got what it takes to topple a contender or two at some point. With a stop in Orlando up next and games against the Spurs and Lakers on the horizon, there are plenty of topple-tunities (forgive me) to come. They've shown that a quarter or two of decent basketball can get them close, but it'll clearly take a steadier performance to actually steal an upset.